It’s Relevant has been working with urgent cares, dentists, and medical offices across the country in order to improve patient experience by doing more with the TVs in their waiting rooms. When it comes to medical offices there aren’t a lot of television options for waiting rooms, and any practice that strives to put patients first will often invest in a waiting area TV service of some kind. Medical lobby TVs should never settle for basic cable. Between the dwell time of patients, and the amount of people that come in and out of the office on any given day, there’s a lot of opportunities to expose them to your brand, services, and reasons for them to come back – none of which is taken advantage of when cable is in the picture. Digital sinage software like It’s Relevant TV gives you the freedom to customize the TV in your waiting room, and is the ideal service when trying to make your waiting room more inviting. TVs are a great way to engage with people because you don’t have to tell someone to look at the screen for them to notice what’s on. With TVs being as prevalent as they are, people are used to watching them. Televisions are familiar and catch the eye better than posters, banners, or signs ever could. Patients wait in waiting rooms. Hence the namesake. They wait to be seen and the wait can be a long one. During that time, if there is a TV present in the room then it’s fair game to assume that someone is going to look at it at some point. This is your prime opportunity. As they watch and you have their attention, you can be messaging to them. In the case of waiting rooms, the TVs we have seen are most often tuned to the news or some light programming with the patients’ comfort in mind. In practice this is a good gesture. However, in an age of rising technology, there exists an alternative. You can still offer patients comfort, but bring more for your practice at the same time. 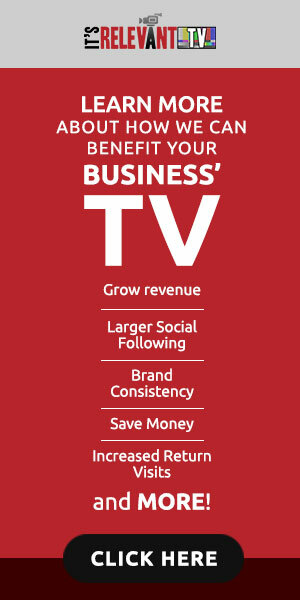 It’s Relevant TV offers more than cable. Cable is great for use at home. The programming that airs on television is intended for the comfort of living rooms where people sit down with the vested interest of watching TV. With the exception of the news, the average runtime of content on TV ranges from 30-60 minutes with an engaging plot or storyline. People in waiting rooms aren’t there to watch these shows. It doesn’t fit with the structure of a waiting room, whereas It’s Relevant’s TV’s short-form content is designed with the brief waiting period of patients in mind. IRTV provides short-form shows that are engaging and informative. They are the sort of thing you can walk away from with something interesting to talk about. Medical Waiting Room TV: What Are You Telling Your Patients? With the decreasing costs of television screens, medical offices across the nation are installing more and more of them. Practices put TVs in both waiting areas and treatment rooms to help patients pass the time as they wait. But what exactly are these TVs doing for the practices that are hosting them? And as a practice owner, manager, or administrator, have you taken careful consideration in choosing what to display on them? It’s an unfortunate reality that most medical offices have put very little thought into the programming on their screens. One of the most common reasons for having a TV is to help patients relax and pass the time. But certain types of content can do quite the opposite: creating an anxious environment, and making time feel like it’s moving slower. A large number of waiting room televisions are simply tuned to local cable stations and broadcast channels. These show hourly round-ups of mundane, recirculated news, unpleasant accidents, or useless stories, soap operas, daytime courtroom battles and semi-offensive talk shows. But other options that seem intelligent on the surface can have an even worse affect. There are a host of medical-related TV products that bombard patients with irrelevant health content. These are paid for by ad services designed to subliminally sell their products to your patients. Either of these scenarios can present real problems for your practice. What started as an idea to make your waiting room a more inviting and comfortable space can actually backfire if you haven’t paid attention to what’s playing. As a practice manager it’s important to be aware, and in control of what’s on your televisions. This sounds like a tall order, but with new solutions just released on the market, it is becoming easy. You can quickly control not only the programming, but also add some messaging to help the practice itself. One such service is called It’s Relevant TV. The subscription service allows you to choose from a catalog of 50 topic areas, including stories gathered by well known producers like National Geographic, Food Channel, Minute Science, HowCast, and Medical Minute, allowing you to decide what your patients see while they wait to see you. You can mix things like national news, sports and celebrity interviews, with cooking shows, pets and travel videos. A team of editors filters all of the content, assuring that each episode is family-friendly and office appropriate. Promoting Your Practice on TV, But that’s only part of it. On top of the content that is provided, you as the practice, can promote your services, products and community involvement, too. Images, videos and live social media tools get your messaging across in a subtle way as your patients watch. Almost anything you can create on a smart device, you can upload quickly to your TV screens. It’s Relevant TV has been working with many medical and dental clients across the country. Managers love the professionalism the family-friendly content brings to their waiting room. They love how they can update their patients on their latest products and services, with a lower cost than most cable subscriptions. Television screens can make a big difference in your practice, from higher review scores to increased patient referrals. But it takes the right programming prescription to be sure it’s a positive one. Posted on August 31, 2016 November 19, 2016 Author Editorial StaffCategories Medical Waiting RoomsTags dental office, doctors office, health tv, healthcare, hospital, medical, medical tv, patient care, patient satisfaction, practice manager, research, television, tv, urgent care, wait time, waiting area, waiting roomLeave a comment on Medical Waiting Room TV: What Are You Telling Your Patients?